A friend once told me, “If we both agreed on everything, one of us would be nuts.” Thus, it is not my expectation or objective that all readers of this book be in total agreement with what I have written. Rather, my objective is to stimulate in the reader the incentive to think for himself and rely upon available facts to arrive at improved enlightenment. A nation led by honest, informed thinkers has little to fear from destructive ideologies. Wise old heads have always said that wisdom is wasted on youth. One of my friends expressed it somewhat indelicately by saying that, “Every generation has to learn firsthand the folly of skinning a skunk.” It’s my sincere hope that readers of all ages of these essays can avoid a few skunks. I enjoyed reading James Lee's collection of essays. In it he shares some very interesting history from his personal perspective, reflecting the cultural mores of a time few Americans will recall but all should reflect upon. Many of the articles are thought-provoking, steeped in common sense and sound life principles. The reading is easy, pleasant and meaningful. 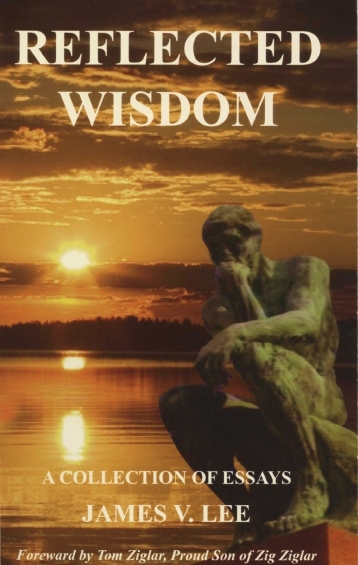 Aptly titled Reflected Wisdom, it's a book I recommend to all. I believe it holds a particular value and interest for parents for their young adult children.